Well OMFG! I am not going to beat around the bush with this review – let me first say a massive *thank you* to the author and Netgalley for an ARC. Then I have to say – Bloody hell….What-A-Book! Set in London, the reader becomes embroiled in secrets and lies; (dysfunctional) relationships; rebellion; betrayal; anger; bullying; obsession; jealousy; frustration and unhappiness. From the moment I started this book, my interest was piqued. Immediately questions were racing through my mind as the suspense and intrigue build up beautifully! Set at the perfect pace, the reader is drawn into a story that keeps you guessing throughout. I mean seriously! I was thinking to myself…”I know exactly where you are going with this clever author lady…” and then I was like….Whaaaaaaaat?? The timeline switches back and forth seamlessly as the countdown to Christmas – the fateful day – has you gasping for air! Told in the third person POV, we get a range of perspectives and I thought this was done brilliantly! I absolutely ADORED the characters in this book – even the ones I didn’t particularly like! Dominque comes across as a slightly paranoid but concerned mother. She seems to be stuck in a bit of a rut and has quite an interesting condition…not sure if I should actually describe it that way as it must be awful…but I’m a weirdo and certain things fascinate me! Not going to spoil it though…you will know what I mean when you come across it! Full of secrets, part of me really felt sorry for her, but then I was like “Woman…get a grip…sort it out…and bloody move on!” – I am pretty terrible, aren’t I!? Ah Ruby…the typical rebellious teenager. However, she too has a secret that she is keeping from everyone but her boyfriend Harry. She is full of anger and rage – so understandably, she acts out but also is hiding behind a mask of self-loathing. I really felt for this character. Amber – or Mouse as she is known is Ruby’s baby sister- quite an insightful character for someone so young. She sees and hears things that probably put her beyond her years. My heart went out to her at times. Kendra…Kendra….Kendra…what an annoying cow bag! At times I felt sorry for her, but also found her to be quite a selfish and immature woman. Ok, so she was a little insecure, but she also came across as needy and desperate- not very attractive qualities, right?! Benjamin…what a arse. Plain and simple. I felt absolutely nothing towards him…well, that’s not true…I pretty much despised him. Materialistic, narcissistic, and ever other #istic going! I am not even sure he had any redeeming qualities. But a fab character! LOL!! Finally- Harry, Ruby’s boyfriend- another rebel without a cause, he came across as quite a lost soul. He was the complete opposite to Ruby in terms of his economic background and I really felt for him. Ruby and Harry found in each other what they felt was missing from their lives: understanding, acceptance and love. Awwww. Another great character. This was such an emotive read. SUPERB! As a reader, you are innocently led down the garden path by the author, fairly confident of where you are going until….BOOM! – Barbara Copperthwaite blows it all out of the water and you are standing there frozen, mouth gaping open, thinking…What-the-actual-frig-just-happened!? Well played, Mrs! Would I recommend this book? Is the Pope Catholic? Of course I would- with bells on! This has one hell of a jaw dropping twist that I didn’t even see coming…it is dark, emotive and absolutely unputdownable – so readers…don’t wait, grab a copy of this book now…you can thank me later! This entry was posted in Book Reviews and tagged #Crime #Twists #Murder, #CrimeFiction, #Psychological, #Suspense, #Thriller, #TopRead2017, #Twists, Bookouture by crimebookjunkie. Bookmark the permalink. I hope you enjoy it as much as I did, Kathleen. Wow! 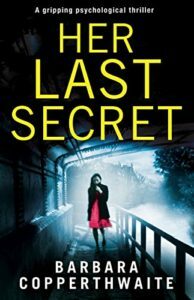 Her Last Secret is now on my list.